Find hotel near Walworth Methodist Church .. Located in the heart of London borough of Southwark, Walworth Methodist Church (clubland), Camberwell Church dates back to the year 1813. From just a handful of members in the year 1970, the Church has grown tremendously and gone on to become one of the largest congregations of British Methodism. The Church has had many popular visitors like Robert Kennedy and Her Majesty Queen Elizabeth. The quite interiors and the well-maintained premises is a welcome change from the busy traffic of Camberwell road. 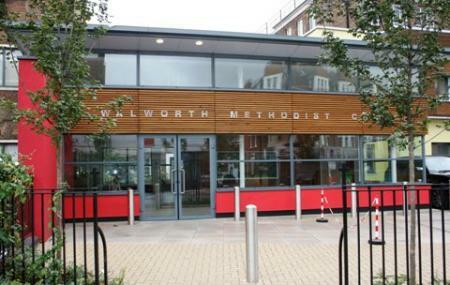 Use Camberwell trip planner to visit Walworth Methodist Church (clubland) and many others to your visit. Hotels like Belgrave Hotel, Victor Hotel - London Victoria, Best Western Corona Hotel and Sidney Hotel London-victoria will solve your problem of where to stay in Camberwell. Curated Camberwell vacation packages await! Book the best ones and start turning your dream into reality.Discover various ways for how to reach Camberwell and complete the booking by choosing your mode of transport. Very good area for worship and meetings and social functions. Nice place that is people-centred. Loads of life changing activities happen here. My one and only church that I worship. Walthoth church whatch for centre theif stole my goods never call you back hopeless surity hopeless staff theirs.